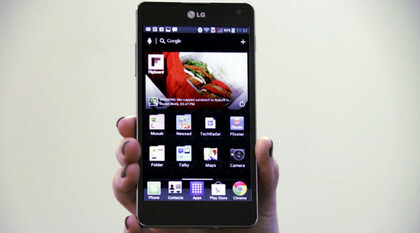 LG’s road to smartphone success has been rockier than most. After false starts with the Optimus series, LG basically took 2012 off; a sabbatical from the top-tier end of the market to gather its thoughts. 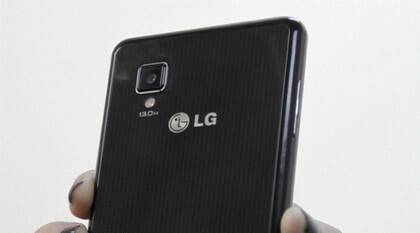 During this time it focused on the pre-paid and BYO segment with its cheaper L-Series models like the Optimus L5, and having enjoyed some success with them, now makes its return to the big leagues with the Optimus G.
LG is also responsible for the popular, but difficult to obtain, Google Nexus 4. If you are familiar with Google’s mobile unicorn, you will have a headstart in imagining the Optimus G. They share the same glass finish, front and back, and an identically specced 4.7-inch IPS display. LG relies on Corning Gorilla Glass 2 to cover its phones, and promises some durability in line with how Corning markets the Gorilla Glass products. Still, as it is with glass on any phone, you don’t want to be dropping the Opitmus G.
Both the G and the Nexus 4 have a sparkling, reflective back plate under the glass that catches the light, and your attention, when you hold it in a certain way. The handset shimmers, like electronic circuitry when the light bounces off this surface. The Optimus G also has a stainless steel trim that runs around the edge of the phone and really pulls the design together.It feels nice too, with rounded corners, so it sits comfortably in the hand. All this said, the Optimus G still isn’t particularly eye-catching. For all of the criticism leveled at Samsung for its plastic handsets, they are instantly recognisable as Galaxy handsets. The Optimus G is a featureless black box when not in use, but then, perhaps this is your preference. Button placement is similar to the Galaxy S3, with a power button on the right side and volume on the left. The Optimus has a headphone socket on the top of the handset and a micro USB port on the bottom. 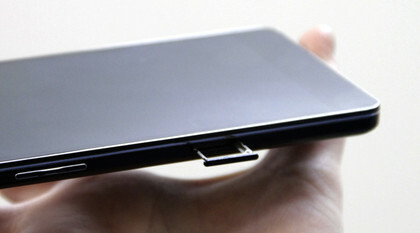 A micro SIM can be inserted into a space on the side of the phone, under the volume rocker. 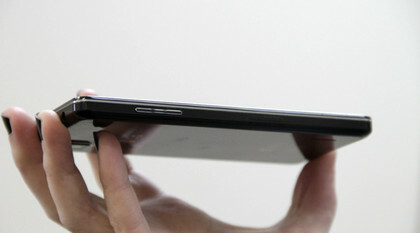 To get this slot out you need a sharp pin, similar to the iPhone and HTC’s range of phones. The handset is completely sealed, removing a user’s ability to access the battery, and it doesn’t have a slot for micro SD cards either. The handset does have 32GB of storage though, which is rather generous, so hopefully most people won’t miss the expandable memory option. On the back of the handset you’ll find a small, square camera lens and an LED flash. Beside it, on our review unit, it states that the camera is 13-megapixels. This is a promise to photgraphers that the Optimus G never lives up to — but more on that later in the review. The first thing you’ll see when you power the phone up is LG’s very cool unlock animation. It is difficult to describe: it’s sort of like a magnifying bubble that grows in size as you swipe your finger across the screen, revealing a distorted version of the screen underneath. It is one of those small touches that barely impacts on your use of the phone, but has the ability to make your day all the same. We challenge you to handle this phone for a couple of minutes and not spend the whole time swiping back and forth on the lockscreen and watching the mysterious bubble. There’s no official word yet on UK plans and pricing through the telcos, but Expansys is now selling the Optimus G outright for £469.99. In Australia, the Optimus G is available through Telstra for $63 per month on a 24-month plan or for AU$699 upfront. 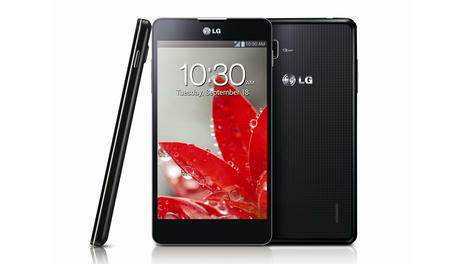 LG has made quite a fuss about the 4.7-inch IPS display used in the Optimus G in the lead up to the launch of this phone. As part of the design process, LG removed several layers found in touchscreens today, and incorporated digitiser layers into the LCD panel. 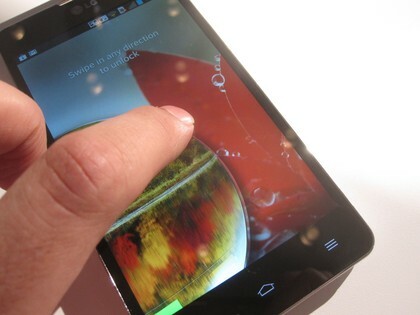 This helps to make the touchscreen more sensitive, according to LG, but it also improves the colour on screen. Having less screen layers brings the panel closer to the glass protecting it. LG call this a zero-air gap, and with less space between these layers there is less light refracting and diluting what we see on screen. This is absolutely evident when looking at the Optimus G. Whites look crisp and, well, white; especially next to a Samsung phone using AMOLED screen tech. Colours really pop too, without any obvious leaning towards a particular hue. It all looks even and vibrant. The zero-air gap also has the added advantage of making the screen look black, and not grey, when it is turned off. This makes it impossible to differentiate from the bezel and the screen when it is sitting on a desk in front of you, which is a pleasing thing to see. The user experience is a heavily customised LG design, and strongly reminicent of Samsung’s TouchWiz in its bright colour palette and cartoon-ish iconography. It is a shame that LG went in this direction with software design, as it completely belies the premium look and feel of the hardware it sits within. The good news is that LG offer numerous options to make the UI unique to each user. 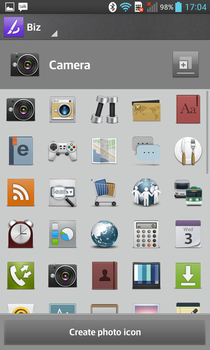 For starters, there is a Themes option in the menu that lets you choose from four pre-designed options that change the wallpaper and all the system icons in one go. If these still don’t help the Optimus feel like it’s yours then you can individually change any icon for any app on the homescreens. If you press and hold on an app on the homescreen, and then let go, a purple circle appears on the icon. Press this and you have the chance to update the icon with any image on your phone, or one you take using the camera. The strange thing is, that when you choose a custom icon, it doesn’t also change the app’s icon in the app drawer, so you end up with multiple icons for the one game or tool or service. You can also change the animation used when you flick through pages on the homescreen, based on a selection of 3D-like transitions. This is the sort of customisation you used to only find in custom ROMs downloaded from specialist forums. While we don’t love the way the UI on the Optimus G looks, we do love how it works. This is one genuinely fast smartphone, powered by a new(ish) quad-core Qualcomm Snapdragon S4 Pro clocked at 1.5GHz and with 2GB RAM in support. This speed and power is noticeable across the entire user experience, from the smooth and fluid animation, the fast app switching to the fact that the phone can essentially display three apps at one time. That’s right: three apps at once. This is a feature LG calls QSlide. Basically there are a half-dozen QSlide enabled apps, including a browser, calendar, calculator, note-taker and video player. These apps can be launched over the time of any other app on the phone, and using sliders, the transparancy for these mini-apps can be adjusted so that everything onscreen is visible all at once. For example, you could have a YouTube video open a Chrome browser window, while you scan a favourite website on the QSlide browser. Or you could be watching a video at 50% opacity while playing Candy Crush Saga underneath it. Apparently this feature is big in Korea where DVB-H TV broadcasts are common and people are reluctant to miss a moment of their soap operas while replying to text messages. For the rest of us, it is a neat trick, but not something we found we used besides testing it. 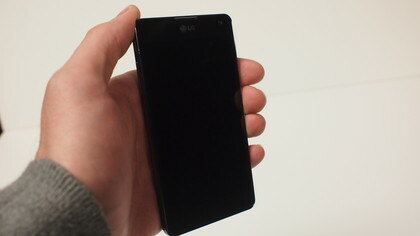 LG include a 2100mAh capacity battery with the Optimus G, which is a decent sized battery, without being amazing. Battery life during our tests was 4.5-hours continuous web browsing on a Wi-Fi connection — which is pretty good. Anecdotally, we saw a solid day’s worth of battery during the business week, but no more. Even though the applications have been given a coat of paint by LG, the calling functions on the phone, and the address book, are pretty standard for a modern smartphone. Your contacts list can be compiled from a number of sources: Gmail, Facebook, a Microsoft Exchange account, Twitter and others. When you sync a new account you can choose whether to include phone numbers from this source in your Address Book, or hide them. Hidden contacts are still searchable, but not shown in the list. 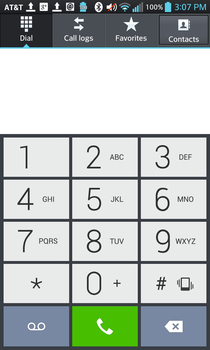 To find a number to call, you can either search for the contact and select them from the Address Book, or alternatively, you can can start to type the person’s name using the T9 alphabet on the keypad in the Phone app. Typing 323 will bring up Dad if you have him in your Contacts. 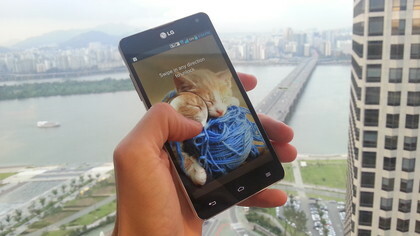 One of the hidden features of the Optimus G is that it includes HD Voice calling, a relatively new network feature that transmits a higher bitrate voice signal on compatible networks. Three and Orange supporting HD Voice in the UK, T-Mobile in the US and Telstra in Australia. You also need to be speaking with someone with an HD Voice compatible phone, which is a bummer, but if you manage to satisfy all of these requirements, the result is pretty impressive. As with calling, messaging and email are delivered without surprise, even though these apps have been redesigned from Google’s spec by the LG team. 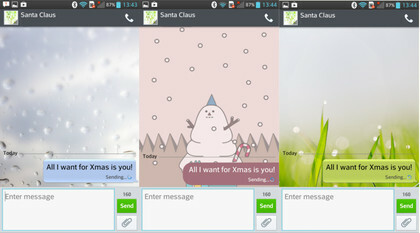 The Messaging app benefits from having a number of user-selected skins that can change the look and feel of the app entirely. 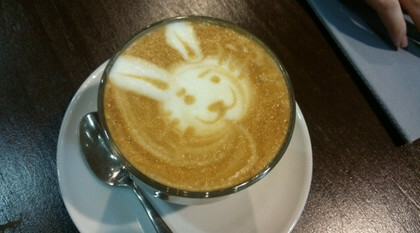 Some are fun, others are more business-like, catering to a range of tastes and purposes. One annoyance with LG’s design is that it has removed the ‘back’ button from within the message window, so that when you finish reading and replying to a message there is no way to return to the inbox. You can press the ‘Back’ on the handset’s virtual navigation keys, but this will exit the app if you enter the app straight into a message, ie: from the notification panel. The Email app has a similar problem, but we did find a "back to inbox" option hidden away in the menu. LG includes its own keyboard design into the mix, too, replacing the default Android layout and side-stepping a third-party option like Swype. This keyboard is pretty easy to use, and has its own continous letter tracing input option (like Swype) but it is far less accurate and has a few annoying quirks too. In particular, we dislike how when you press on an auto-correct error you aren’t given the choices that were there when typing the word. 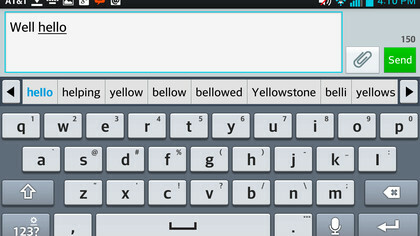 Most other Android keyboards do this, but with the LG keyboard you have to manually delete the word and start again. 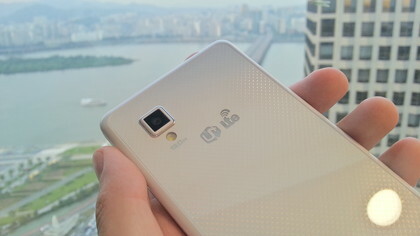 Though it has big numbers associated with it, the 13-megapixel camera is probably the most disappointing aspect of the Optimus G. If anything, 13-megapixels just means a few million more pixels in each digital mess this camera produces. OK, digital mess might be taking it a bit far. The Optimus G does take reasonably nice photos on bright sunny days: so long as there isn’t a strong light source behind the subject and your hands are still to assist the auto-focus. Beyond these perfect photo opportunity, the Optimus G will struggle. In decent indoor lighting you will probably have a 50% chance at a photo you’d choose to keep, but the auto-focus is a constant concern. Mixed lighting conditions bring the camera in the Optimus G to its knees. Subtle differences in light often result in poor shots, while a strong light source in frame will ruin any photo. 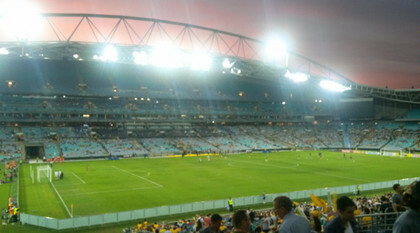 We attempted to take several shots at a football match, but the stadium lights bloom like firecrackers. The camera has plenty of software tircks and gimmicks though; obviously where LG spent the bulk of their development in this area. There is a burst shot mode that lets you choose your favourite shot from a small collection, there is the ability to take selfies by screaming "cheese" and there is even a feature that takes several shots before you press the shutter in case you miss that perfect moment. Ultimately, these features mean little when the photos end up looking so average anyway. 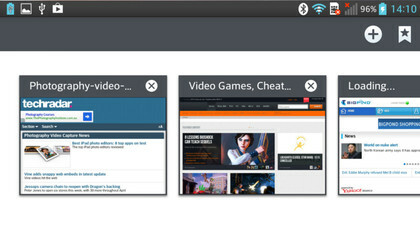 If there is one thing the Optimus G does very well, it is browse the web. 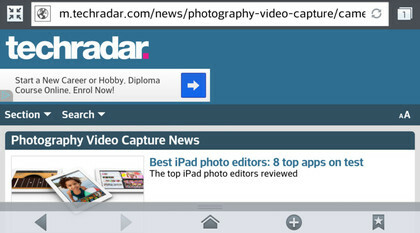 The default browser borrows heavily from the Google Chrome browser, in its layout and UI, and feels great to use. It has a few neat tweaks all of its own, too. There is a tiny slide-up navigation panel at the bottom of the screen that gives you quick access to Forward and Back controls, Home and Bookmarks. You can leave this panel always on, or slide it down to minimise it. You use a pinch gesture to zoom in and out of content on the page, and the browser can resize and realign text to fit into these new dimensions after zooming in. Importantly, the Optimus G is 4G network-ready, so if your telco has 4G services set up, the Optimus G might be compatible. 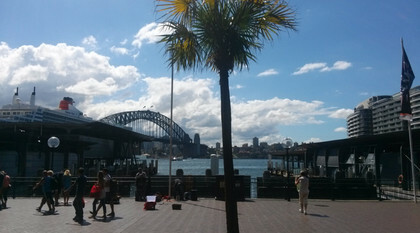 In Australia, where we are testing the Optimus G, the handset has regularly speed-tested in excess of 30Mbps, which is faster than you’ll even need for a bus trip full of lolcats. LG smartphones have always been at the forefront of media codec support, and the Optimus G is no exception. It can play Mp4, DivX, WMV and H.264 video files and huge range of audio including FLAC. This is more important now than before, as the Optimus G has the potential to be your home media server, to a certain degree. Incorporating the latest Miracast wireless streaming protocol, the Optimus can stream media to a Miracast compatible TV or monitor. Of course, being a new protocol means that most TVs in living rooms won’t support Miracast now, so LG is selling an HDMI dongle to bridge the gap. This is a remarkably easy to use technology, not unlike Apple’s AirPlay. Once connected, the Optimus G can stream 1080p video content to a TV, and better still, you can continue to use the phone while the content streams in the background. If you don’t want to watch a movie, you can use Miracast to share your phone’s screen wirelessly with a larger display. 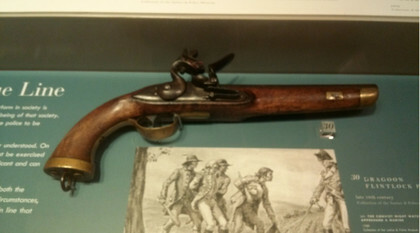 This is a great solution for road warriors who want to conduct presentations off of their phones rather than a laptop. It isn’t great for gaming, though. Despite sounding like the perfect way to get Real Racing 3 on to your TV, there is just a little too much latency in the Miracast connection to interact with a fast-moving game. There’s no doubt about it, this is the best LG smartphone we’ve ever used. It is impressively powerful, carefully designed and features all of the bells and whistles we expect in a top-tier handset. It does enter the market at a difficult time, though. 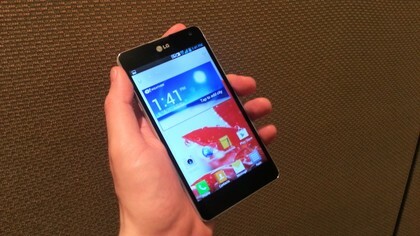 The glass chassis makes the Optimus G nice to hold, even if it’s sleek, black good looks lacks the wow-factor other phones have. More importantly, we love what this phone can do and how quickly it can do it. This phone has a decent amount of power under the hood and it never feels like it is lagging behind. It always responds quickly to input, and multitasking is a breeze. Miracast is another favourite among the TechRadar team, though this isn’t a feature to be shopping for just yet. Unless you plan to fork out extra for the compatible dongle for your TV, it will seem pretty useless. Compared to the amazing advancements in smartphone cameras this year, the camera in the Optimus G is a stinker. Scanning through all of the shots we’ve taken, the majority are those you’d delete rather than keep. We understand why it is important for LG to offer a unique and customised user experience on the phone, but it should really hire some new designers. The cartoon-ish design looks like it is for children and it undermines the idea of the Optimus G as a premium model. Also, there are a few quirks in the UI that become really annoying after using the phone for a while. Not having a Back button in the Messages app stands out in our memory, but it is not alone. On its own merits, the LG Optimus G is an accomplishment. It hails a return to form for LG after numerous smartphone failures, and if this were last year, it would be a home-run, for sure. But, it’s not last year, and as LG finds its feet with the Optimus G, the competition is sprinting past with newer, faster, prettier phones, with better cameras and the latest features. 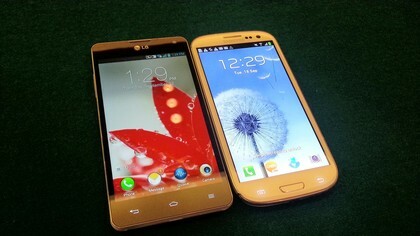 The Optimus G stacks up well next to a Galaxy S3 or an HTC One X, but not so well next to their successors.